The browntail moth, Euproctis chrysorrhoea (L.), overwinters as larvae (caterpillars) in colonies that are enclosed within webbed nests of white silk tightly woven around a leaf in trees or shrubs. 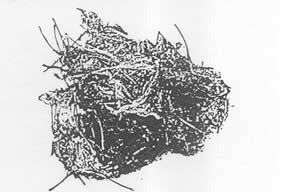 The nests are spun in the early fall, contain 25 to 400 larvae, and remain firmly attached to twigs or small branches through the winter and early spring.The webs are often confused with silken structures formed by other less serious species of moths. Proper identification of browntail moth winter webs is important. Web counts can be used to quantify browntail moth caterpillar populations to be expected in the spring, a prerequisite for planning control projects. Also, clipping and destroying overwintering webs by either soaking in water and detergent or burning in an incinerator can provide control of isolated populations located in low trees and shrubs. Among the webbed structures most often mistaken for browntail moth webs are old expired webs of the fall webworm, Hyphantria cunea. The webs, which may be numerous in some areas, are formed and occupied in summer and early fall by yellowish caterpillars with many tufts of long hairs and brown markings. The webs engulf the foliage on branch tips and can become 2 to 3 feet long. By mid fall the larvae have left the nests. During winter the nests become detached, and hang loosely from branches. Remnants of expired webs or tents of the eastern tent caterpillar, Malacosoma americanum can also be mistaken for the winter webs of the browntail moth. These webs are built in the crotches of branches of wild cherry and apple trees in late April and May and may be a foot or more long when fully formed by early June. The tents also resemble the spring and summer webs of the browntail moth. Eastern tent caterpillars, which are present in their webs from late April to June, are covered with brown hairs have a solid whitish line down the middle of the back with a row of oval pale blue spots on each side. Browntail moth larvae are also covered with dark brown hairs, but have a broken white stripe down each side of the body and conspicuous, unpaired, reddish spots on the posterior end of the back.